I got a MacBook Pro and I forgot my administrator username and password and I can't log in into my account. If I use my guest account I can't log in into my iCloud because it is asking me for my administrator credentials. How can I reset my computer or reset my administrator information? I have tried to open a new Apple ID but I still need my administrator permission to log in. One way to reset your password is using set Password assistant (FileVault must be on). When the Reset Password window appears, follow the onscreen instructions to create a new password. If you need to connect to Wi-Fi, move your pointer to the top of the screen and use the Wi-Fi menu to connect. 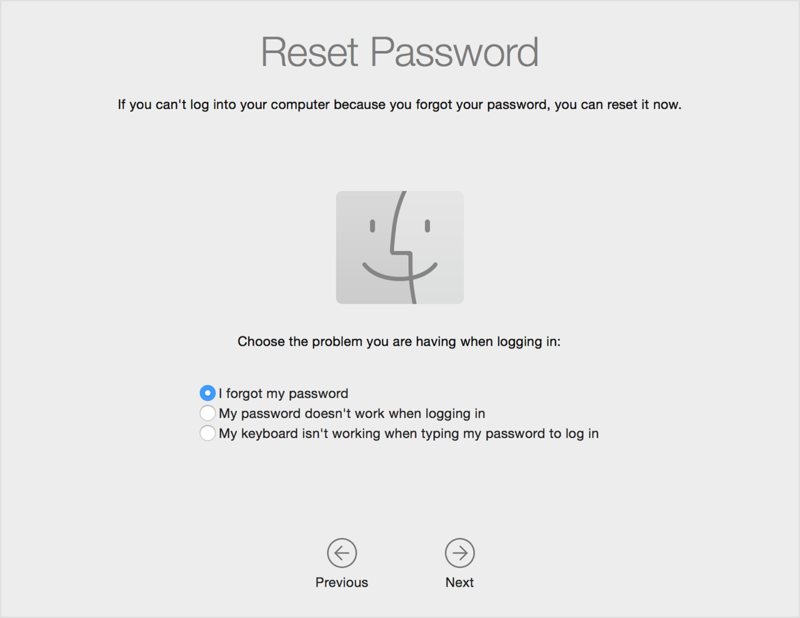 To exit without resetting your password, choose Apple menu > Restart. Click the arrow next to the message. The password field changes to a Recovery Key field. Enter your Recovery Key. Use uppercase characters, and include the hyphens. Follow the onscreen instructions to create a new password, then click Reset Password when done. Turn off your Mac (choose Apple > Shut Down). Press the power button while holding down Command + R. The Mac will boot into Recovery. When you see the load bar appear you can let go of the keys. It may take a few minutes to load. Select Disk Utility and press Continue. Enter resetpassword (all one word, lower-case letters) and press Return. Select the volume containing the account (normally this will be your main hard drive). Choose the account to change with Select the User Account. Enter a new password and re-enter it into the password fields. Enter a new password hint related to the password. A warning will appear that the password has changed, but not the Keychain Password. Click OK.
Click Apple > Shut Down. Not the answer you're looking for? Browse other questions tagged macos password administrator . How to unlock Mac password?